New Years evening 1966 I was sitting in our lofts room close to the window too look for the firework. I was sitting there and waiting, I was also close to my little 20 liter aquarium. 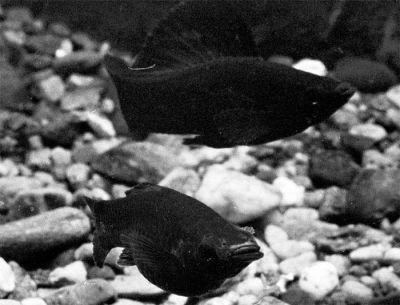 Then I was seeing that something where happen in the aquarium, my Poecilia sphenops, Black Molly have for me a strange behavior. But when I look closer I was seeing for the first time in my life that a fish was giving life to her children. First I don’t believe what I was seeing; I was so excited that I feel I was freezing all over my body. It was so great moment I don’t feel the present, I was only floating a way. New Years evening and firework was forgotten, I was only sitting there and see the mother was given life to 21 beautiful Black Molly. I was in heaven and only thinking about my small beautiful Black Molly baby for the weeks to come, I was for first time in my life the proud father of beautiful fish babies. This was the moment for the birth of my interest for aquarium and fishes, how have been a main part of my life from 1966 – 1997 and again from 2006. From 1966 to 1968 I was breeding very much Xiphophorus hellerii, Poecilia sphenops, Poecilia reticulate, Xiphophorus maculates og Poecilia kykesis. My others breeding you find in the sub-menu under "My breeding"
In the beginning of 1967 I was visiting a friend from the school and see his female Pseudocrenilabrus multicolor multicolor with youngster in the mouth. I feel he was fare in head of my knowledge about breeding aquarium fish. But very fast I also get youngster of Pelvicachromis pulcher, Pseudocrenilabrus multicolor multicolor, Hemichromis bimaculatus and other aquarium spices. After that it has become very mush breeding of species and lots of breeding aquarium's. To breed aquarium fishes have been for me like a lifestyle for the most of my life. In the present moment I feel this is back in my blood, may be heavier than ever. To breeding aquarium fishes is very funny and gives so much joy to you sold, it is a part of me and will be this for the rest of my lifetime. To see new life been created is a gift from the Lord, to participated in this is a joy and gives so much to your the sold, health and body. You feeling you are living with the processes of the nature. To show this to the children and see their joy and happiness in their face and eyes is like a new gift from the Lord. The nature is a true friend, it's give your sold and body peace and happiness. I always feeling this when a new life is born like I feeling this when I am in the mountain and the wind is stroking my skin like touché from the nature. Have fun, breeding the aquarium fishes in the original look the nature have created them. Human made stain can never bet the natural stain. Today, there have been 35157 visitors (90891 hits) on this page!